Soda drinks aren’t as popular in the United States as they used to be. 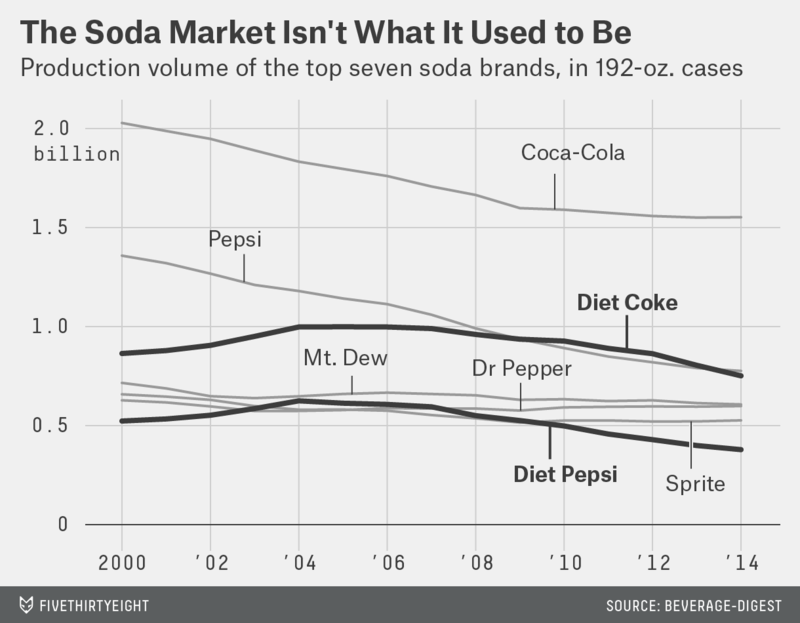 Diet sodas are going back out of style. After four years of outselling Pepsi, Diet Coke is back in the No. 3 slot for top sodas in the U.S., according to the latest industry data, and other sugar-free brands are also dropping quickly. Overall, the number of soda drinkers in the U.S. continues to shrink, as is clear by the steady decline in the volume of soda produced since 2000. According to Gallup, more Americans than ever (63 percent as of July) actively avoid drinking soda. But those who still want their drinks carbonated seem to prefer full-strength sugar and calories. So where are all these soda drinkers going? Data from Beverage-Digest, an industry publication, on “liquid refreshment beverages” (a group that includes carbonated soda drinks, energy drinks, bottled water, sports drinks, ready-to-drink teas, juice drinks and other categories) goes back only to 2011, but since then, Coca-Cola, Pepsi, Mountain Dew, Dr Pepper, Sprite and Aquafina have all experienced decreases in their market shares. Gatorade, Nestlé Pure Life, Dasani and Poland Spring, on the other hand, have all increased their market shares. Arizona has remained stagnant. It’s worth noting that since 2011, Coca-Cola’s and Pepsi’s production volumes have gone down only 1 percent and 9 percent, respectively, while Diet Coke’s and Diet Pepsi’s volumes have gone down 16 and 17 percent, respectively, suggesting that it’s the diet soda drinkers who are leaving the market for healthier options. So while it may seem like a blow to public health that diet sodas are less popular than they used to be, it could be a positive sign if there are a few more water drinkers in the beverage market. CORRECTION (March 28, 1:01 p.m.): A previous version of the chart in this article incorrectly gave the y-axis unit as trillions of 192-oz. cases. It is billions.